This afternoon, the Law Society of British Columbia voted 20-10 to hold a referendum on the issue of accreditation of the Trinity Western University. This came after a vote of 9-21 against deciding to overturn its previous decision in April to grant accreditation. * That first motion arose from a non-binding resolution of a special general meeting of the entire B.C. Bar, held in June. A third motion, to defer any decision, was obviated by the decision to hold a referendum. In deciding to hold a referendum, the B.C. benchers have abdicated their responsibility as the directors of a self-governing profession. Either they should have stood by their original decision to grant accreditation, or they should have reversed their decision based on the interventions made at the June special meeting. Instead, they have decided to distribute the decision-making authority to the general membership. While this may seem ‘democratic’ in a populist sense, atomizing a decision-making power to the membership is not democratic because the public has entrusted the legal profession to govern itself. The Law Society derives its authority to govern in this instance not from the electors but from the people of B.C. The election of benchers is not only an act of selection but of submission to the public interest in exchange for the monopoly over legal services. Since the public has no voice in the process apart from legislative amendment of the statute and the appointment of a handful of lay benchers, a voluntary referendum not mandated by the statute exceeds the Law Society’s jurisdiction requiring it to be governed by benchers. In this regard, the B.C. Law Society’s decision was not only unlawful. It also showed a lack of understanding of the purpose of law societies. The problem with the vote today was that a year has not expired. Therefore, the legal condition for a petition by 5% of the membership to require a referendum has not arisen. What, then, is the legal standing of today’s decision? For all the lofty words about leadership in the public interest and the rule of law, the B.C. 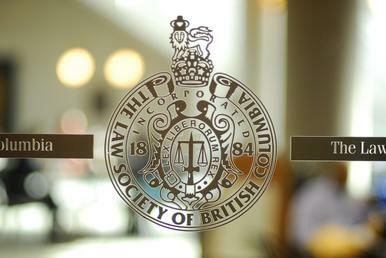 Law Society has washed its hands of the decision-making responsibility and has done so in a legal vacuum. As self-governing entities, the legal profession enjoys a privileged place in Canadian society because its members have undertaken to elect or appoint representatives to govern them. We lawyers often like to complain about the law societies, but we also know that government by a leadership of peers is fundamental to bar independence. Adherence to the enabling statute is the social contract between the bar and the people of B.C. Having the lawyers’ government throw a decision back to the membership without proper legal authority is not self-government but non-government. Such an irresponsible act is a ground for the people of B.C. to consider whether the lawyers in that province are, in fact, governed. *Technically, the April decision was to turn down a motion to withdraw accreditation previously granted through a mechanical administrative process. To avoid the confusion from the double-negative, it is easier to describe the April vote as a granting of accreditation.